Old Persian is one of the two directly attested Old Iranian languages (the other being Avestan). Old Persian appears primarily in the inscriptions, clay tablets and seals of the Achaemenid era (c. 600 BCE to 300 BCE). Examples of Old Persian have been found in what is now Iran, Romania (Gherla), Armenia, Bahrain, Iraq, Turkey and Egypt, with the most important attestation by far being the contents of the Behistun Inscription (dated to 525 BCE). Recent research (2007) into the vast Persepolis Fortification Archive at the Oriental Institute at the University of Chicago have unearthed Old Persian tablets, which suggest Old Persian was a written language in use for practical recording and not only for royal display. The oldest date of use of Old Persian as a spoken language is not precisely known. According to certain historical assumptions about the early history and origin of ancient Persians in southwestern Iran (where Achaemenids hailed from), Old Persian was originally spoken by a tribe called Parsuwash, who arrived in the Iranian Plateau early in the 1st millennium BCE and finally migrated down into the area of present-day Fārs province. Their language, Old Persian, became the official language of the Achaemenid kings. Assyrian records, which in fact appear to provide the earliest evidence for ancient Iranian (Persian and Median) presence on the Iranian Plateau, give a good chronology but only an approximate geographical indication of what seem to be ancient Persians. In these records of the 9th century BCE, Parsuwash (along with Matai, presumably Medians) are first mentioned in the area of Lake Urmia in the records of Shalmaneser III. The exact identity of the Parsuwash is not known for certain, but from a linguistic viewpoint the word matches Old Persian pārsa itself coming directly from the older word *pārćwa. Also, as Old Persian contains many words from another extinct Iranian language, Median, according to P. O. Skjærvø it is probable that Old Persian had already been spoken before formation of the Achaemenid Empire and was spoken during most of the first half of the first millennium BCE. Xenophon, a Greek general serving in some of the Persian expeditions, describes many aspects of Armenian village life and hospitality in around 401 BCE, which is when Old Persian was still spoken and extensively used. He relates that the Armenian people spoke a language that to his ear sounded like the language of the Persians. Old Persian belongs to the Iranian language family which is a branch of the Indo-Iranian language family, itself within the large family of Indo-European languages. The common ancestors of Indo-Iranians came from Central Asia sometime in the first half of the 2nd millennium BCE. 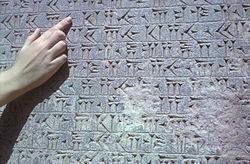 The extinct and unattested Median language is another Old Iranian language related to Old Persian (for example, both are classified as Western Iranian languages and many Median names appeared in Old Persian texts) The group of Old Iranian languages was presumably a large group; however knowledge of it is restricted mainly to Old Persian, Avestan and Median. The former are the only languages in that group which have left written original texts while Median is known mostly from loanwords in Old Persian. King Darius says: By the grace of Ahuramazda this is the inscription which I have made. Besides, it was in Aryan ("ariyâ") script, and it was composed on clay tablets and on parchment. Besides, a sculptured figure of myself I made. Also, the analysis of certain Old Persian inscriptions are "supposed or claimed" to predate Darius the Great. 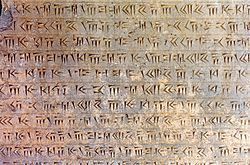 Although it is true that the oldest attested OP inscriptions are from Behistun monument from Darius, the creation of this "new type of writing" seems, according to Schmitt, "to have begun already under Cyrus the Great". Notes: Lycian Kizzaprñna ~ Zisaprñna for (genuine) Old Persian *Ciçafarnā (besides the Median form *Ciθrafarnah) = Tissaphernes suggests /t͡s/ as the pronunciation of ç (compare  and Kloekhorst 2008, p. 125 in  for this example, who, however, mistakenly writes Çiçafarnā, which contradicts the etymology [PIIr. *Čitra-swarnas-] and the Middle Persian form Čehrfar [ç gives Middle Persian s]). ^ Hammarström, Harald; Forkel, Robert; Haspelmath, Martin, eds. (2017). "Old Persian (ca. 600-400 B.C.)". Glottolog 3.0. Jena, Germany: Max Planck Institute for the Science of Human History. ^ (Lazard, Gilbert 1975, “The Rise of the New Persian Language” in Frye, R. N., The Cambridge History of Iran, Vol. 4, pp. 595-632, Cambridge: Cambridge University Press. ^ Ulrich Ammon, Norbert Dittmar, Klaus J. Mattheier, Peter Trudgill, "Sociolinguistics Hsk 3/3 Series Volume 3 of Sociolinguistics: An International Handbook of the Science of Language and Society", Walter de Gruyter, 2006. 2nd edition. pg 1912: "Middle Persian, also called Pahlavi is a direct continuation of old Persian, and was used as the written official language of the country." "However, after the Moslem conquest and the collapse of the Sassanids, Arabic became the dominant language of the country and Pahlavi lost its importance, and was gradually replaced by Dari, a variety of Middle Persian, with considerable loan elements from Arabic and Parthian." ^ Skjærvø, Prods Oktor (2006), "Iran, vi. Iranian languages and scripts", Encyclopaedia Iranica, 13. ^ (Schmitt 2008, p. 78) Excerpt: "It remains unclear why the Persians did not take over the Mesopotamian system in earlier times, as the Elamites and other peoples of the Near East had, and, for that matter, why the Persians did not adopt the Aramaic consonantal script.."
^ Behistun T 42 - Livius.